Slider PRO is the most beautiful Prestashop slider you’ll ever come across with its stunning, modern design. Creating a slider with Slider PRO can make your website attract customers easily. Over 100 pre-made 2D and 3D HTML5/CSS3 slide transition effects are available to add to your slider, making Slider PRO to be the most powerful Prestashop slideshow module over the market place. 500+ Google fonts are integrated with Slider PRO so that you can select any font you like from the available list. The font will be added to your slider by a single click and no coding is required at all! A Color picker with unlimited color combinations is included in Slider PRO giving you an easy way to select the colors suitable for your website. Each element that appears on Slider PRO is present in a layer. This is a new and innovative technology that changes the world of website slider completely! By sliding elements on the slider into layers, Slider PRO allows you create any kinds of interactive and stunning sliders you want, unlike in other free Prestashop slider modules. Therefore this module is definitely the best slider builder tool for you. Slider PRO backend interface is designed to be simplistic, making it easy for you to use. The backend is user-friendly and anyone can easily master this Prestashop layered slider module even without reading its user-guide! The backend of Slider PRO is completely built with jQuery and Ajax which allows you quickly create an awesome slider just by dragging and dropping elements into the positions you want. You can also preview the changes you make live, directly from the backend instead of having to navigate to the front-end. Mobile view is an important factor which we paid a lot of care to when developing Slider PRO. Each and every aspect is well implemented and tested to make sure the slider will display perfectly on any kind of end-user screen regardless of the screen type and size. Slider PRO’s mobile view is designed carefully to make sure your customer will see the entire slider easily and clearly even on small screens. This is a unique feature that may only obtain with Slider PRO and not with other free Prestashop slider modules. Slider PRO is optimized to ensure that the slider can be loaded instantly when one of your customers lands on website home page. To achieve an optimized performance, Slider PRO is built with advanced technology that helps it works smoothly on both the frontend and backend even when you have a complex slider with many images and other elements. 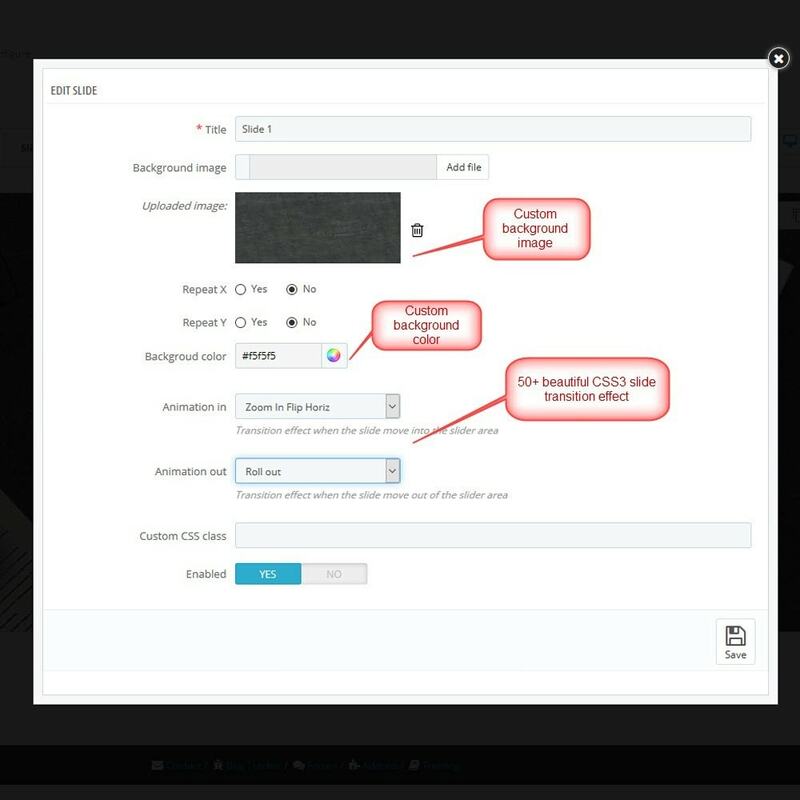 Entire slider content can be imported and exported in a single click of your mouse. Import/Export is a great features which give you the ability of creating a backup of your slider any time you want, transferring your slider content between websites, and also integrating the slider with any third party software. 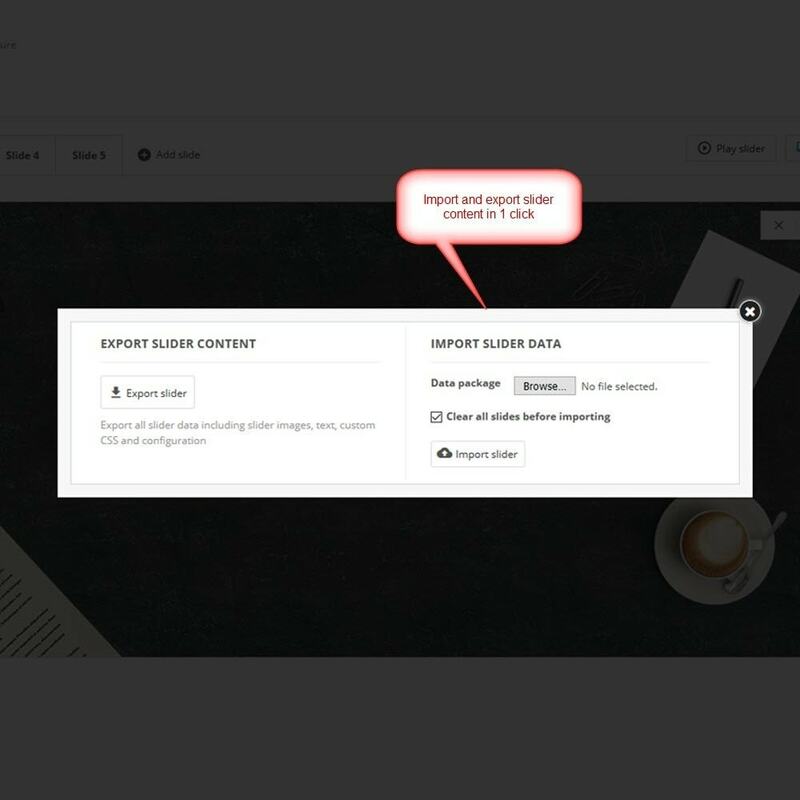 This features ensures that once your slider is builder you can use it on any website by easily exporting and importing the content. Slider PRO is easy to be installed on all Prestashop e-commerce websites. This Prestashop slider module works perfectly with any Prestashop website even if the website uses a custom theme and has many custom modules installed. Custom CSS usage is also supported to help you make any required changes to the display of the slider if you possess knowledge in HTML/CSS coding. 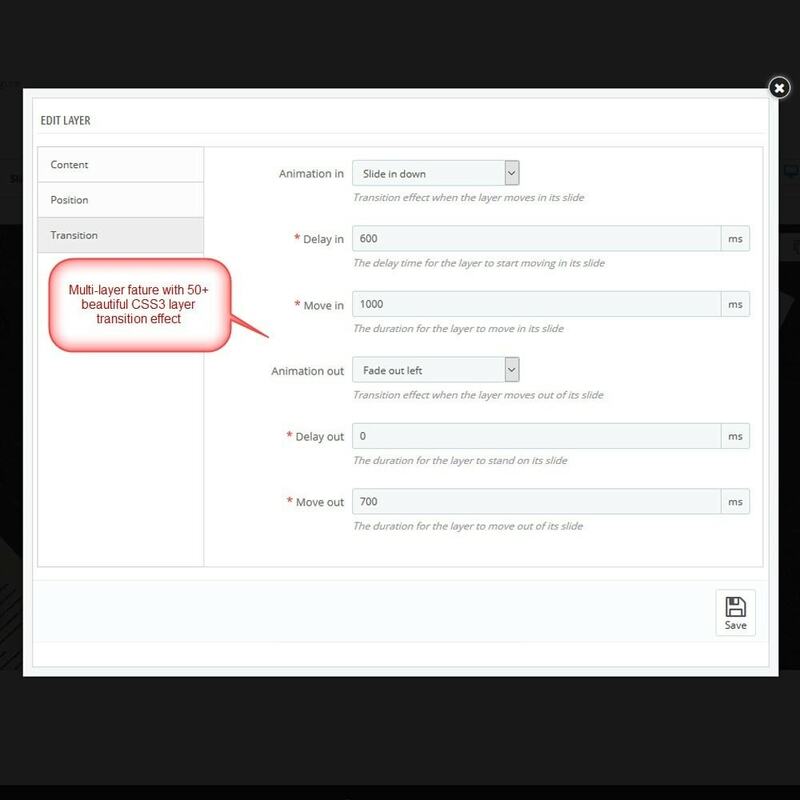 Slider PRO is well-coded, and this helps you to easily extend the default features of the module by adding your own custom code or making extra customizations by changing the existing code. 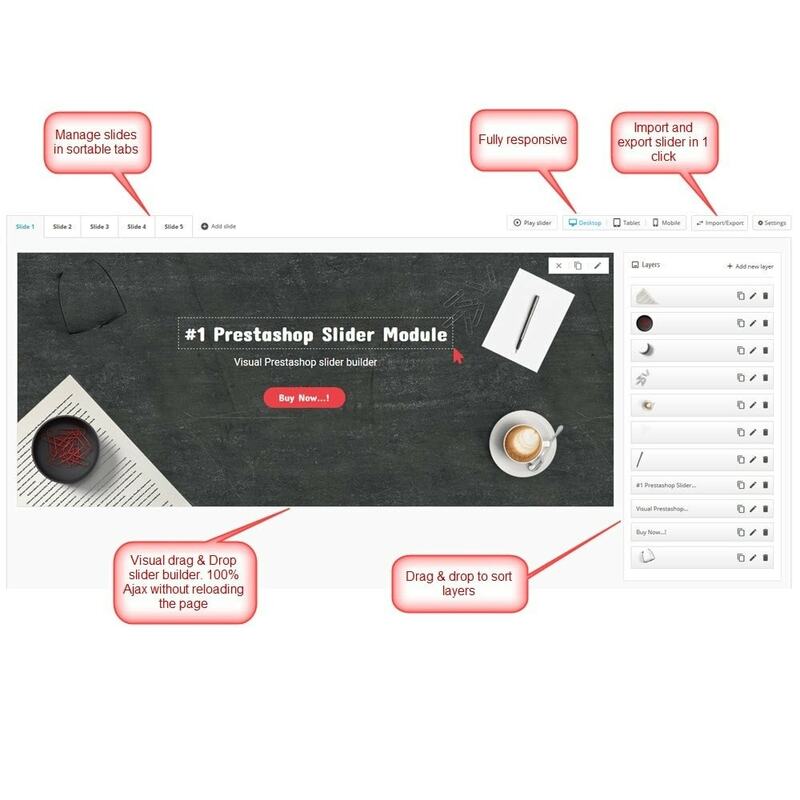 By offering a custom HTML layer, Slider PRO allows you to use any kinds of multi-media content on your Prestashop slider. E.g. : photos, videos, audios, Google maps etc. You can make your slider interactive and attractive to the customers by adding these multimedia content. We have optimized the front end of Slider PRO with latest SEO standards, making it easy for you to improve your website’s rank on Google and all other major search engines, to attract more customers to your website. Slider PRO supports all languages including RTL languages like Arabic, Hebrew, and Syriac. 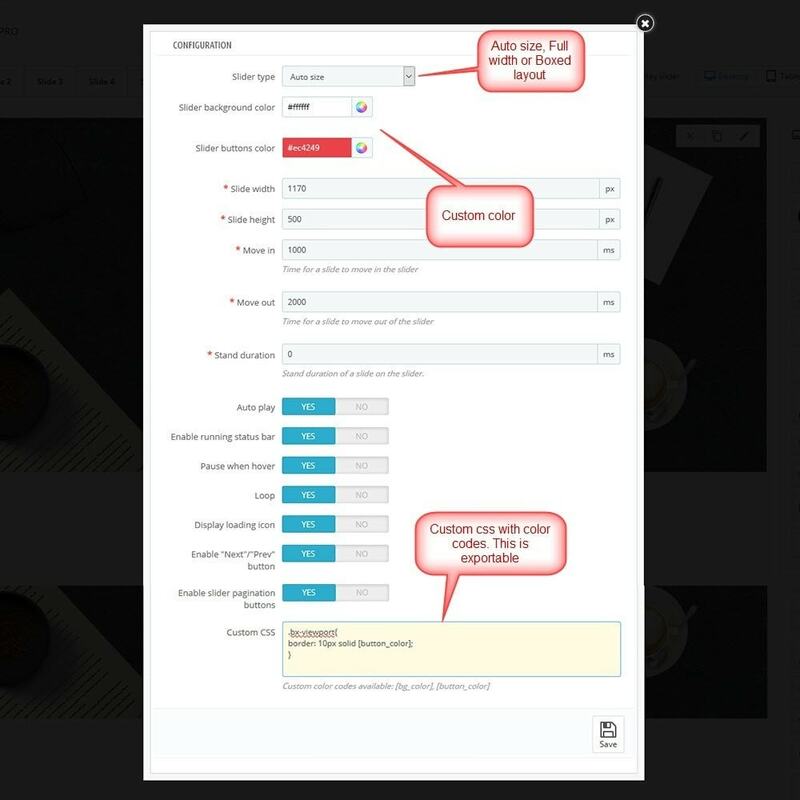 We have included this multi-language support feature to Slider PRO to enable the slider to be used on any international standard website having customers around the world. 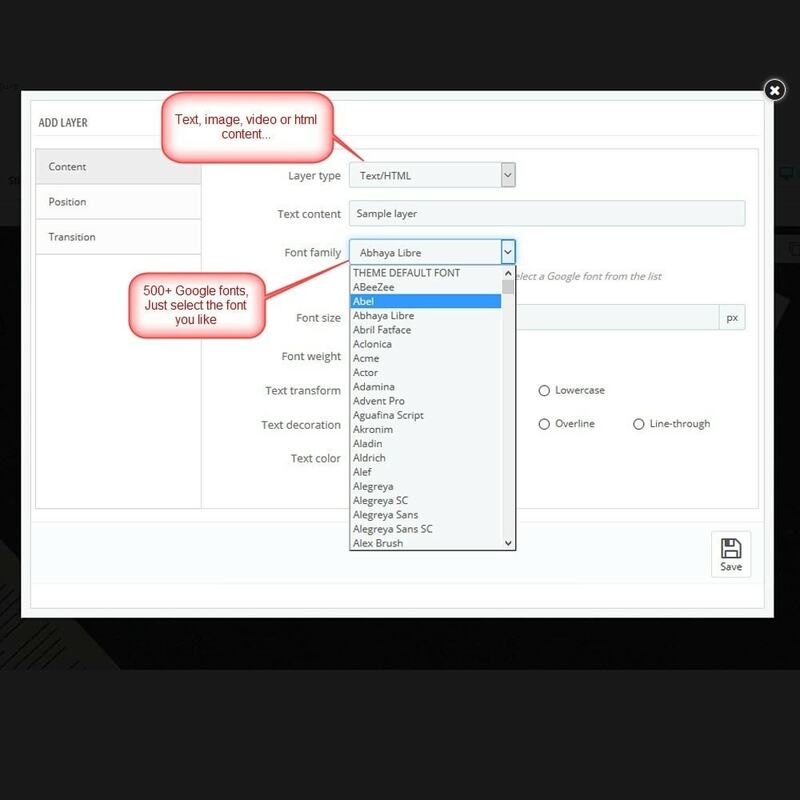 Both the frontend and backend content of Slider PRO can be displayed perfectly on RTL layout. You can also switch between RTL and LTR to preview the slider live with the layouts, directly from the backend. Work perfectly on all major web browsers: Google Chrome, Mozilla Firefox, Opera, Safari, Internet Explorer, Microsoft Edge etc. A stunning Prestashop slider is the most important thing that you must have on your ecommerce website as it can make all your main products and services standout to your customers in an attractive manner. 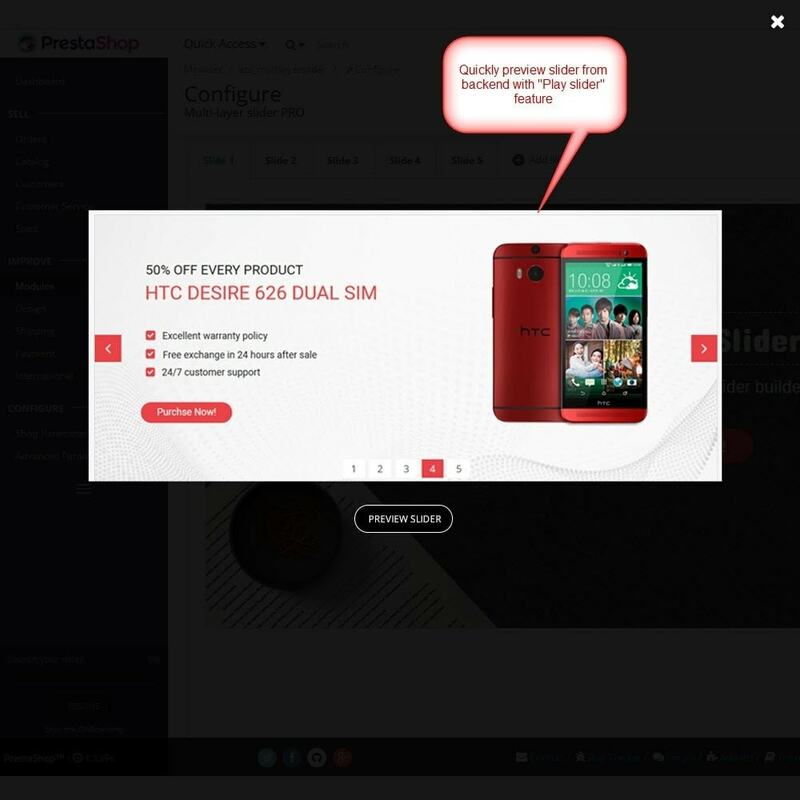 By installing Slider PRO Prestashop slider module, you can definitely make your website look more attractive and professional which will in turn impress your customers when they visit your website. This is a highly important factor which can improve your sale conversation rate easily. Slider PRO helps your website look dynamic with a stunning slider.The layer transition effects available for the slider elements in this Prestashop layered slider module can’t be found anywhere else except in Slider PRO. These features add glamour to your store and also enhance the dynamic nature of your website. Slider PRO is the best Prestashop slider ever! However if it’s not enough for your needs and you’re looking for extra customization service, just contact us! We also provide Prestashop customization service at affordable price and highest quality of work will be delivered. Leave us a feedback of 5 stars if this module is helpful so we can easier promote Slider PRO to more valued customers and invest time to upgrade the module to better versions with more advanced features. Contact us when you see any bugs in the module, we’ll help you to fix the bugs on your website and also update the module to higher level without the bugs.